Note: " Description of our simulators is available in separate category !" The TruTrace 4 EMG is first battery powered optically-isolated EMG system offering unmatched, contamination-free never conduction and needle EMG examinations. Device has 4 channels. Features NCS, EMG, MUP and EP capabilities with playback and replay of one hour of record (see Fig. ). Eye tracking is a technology of tracking eye movements around the observed object or scene. To sense these movements, not to harming the eyes, non-invasive technologies utilizing infrared light are used. Movements are scanned by special cameras, which transmit movements of eyes to the computer through the data set files. The NIRO-200 is a quantitative oxygenation monitor for cerebral tissue and muscle tissue. Used the spatial resolved spectroscopy method (SRS) it can provide the quantitative data for tissue oxygenation index (TOI) in percentage and for tissue hemoglobin index (THI) in a.u., the latter one also can be displayed as normalized THI (nTHI) which stands for the percentage change of total hemoglobin. The i3PC is a portable, high-resolution computer monitor that connects to virtually any PC source (via 15 pin VGA connection), and offers stereoscopic 3D capability*. The i3PC weighs only 8 ounces for lightweight, comfortable wear, and is fully adjustable. With a fixed focal point at the equivalent of 13 feet, they require no focus adjustment or IPD adjustment, even if you wear prescription glasses. 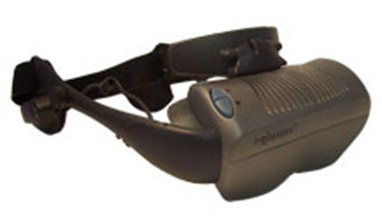 The head-mounted display (piSight) is virtual reality (VR) system. That HMD line uniquely offers both panoramic field of view and high resolution. With its full peripheral vision, excellent visual detail and unmatched image quality, the HMD is used for numerous applications including virtual prototyping, training, data mining and more. 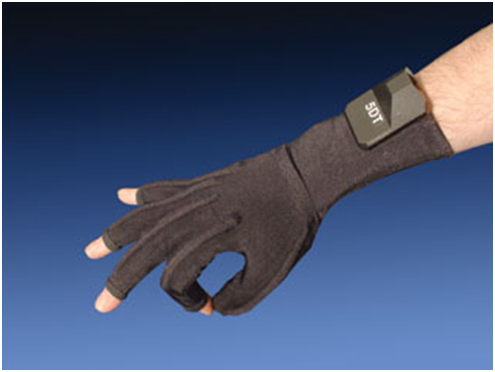 The 5DT Data Glove 5 Ultra measures finger flexure (1 sensor per finger) of the user's hand. The system interfaces with the computer via a USB cable. A Serial Port (RS 232 - platform independent) option is available through the 5DT Data Glove Ultra Serial Interface Kit. It features 10-bit flexure resolution, extreme comfort, low drift and an open architecture. The infrared based positioning device tracks motion of particular points which are assigned with special small balls. This device is used first for motion tracking in connection with fully virtual simulation (mostly with HMD).